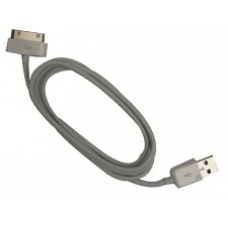 This is a high quality USB cable for the iPhone 3GS allowing you to sync and charge your iPhone or iPOD Touch at the same time using just one cable, also can be plugged directly into the Apple USB Power Adapter for convenient charging from a wall outlet. This iPhone 3GS sync and charge cable is used to upload MP3s and other supported files to your iPhone and is fully compatible with PC and Mac. * 1 Metre in Length. * Up to 400Mbps Data Transfer Speeds. * Suitable for iPOD Touch.